It’s that time again!!! One of my favorite times of year…Halloween! When the first day of Fall came and went on Friday, I couldn’t help but think about all the wonderful things about Halloween. Besides theming out your Christmas tree, it’s the one time of year when you can let your creative juices flow. You can be anything you want to be…from Marilyn Monroe to Marilyn Manson. From Count Chocula to Count Dracula. From a Jack-in-the-box to a Jack-O-Lantern. From…well, you get the point. A great thing about Halloween, the parties! I enjoy all the different foods and interesting recipes people come up with, whether it’s on television or in a magazine. The possibilities seem endless. Speaking of food…this Sundays with Friends comes from Stephanie. I recently ran a sponsorship through Forrester Photography, and Stephanie’s was one of the many recipes I chose to feature on Sundays with Friends. Welcome to Sundays with Friends, Stephanie! I made these for my boy’s birthday party this year. The theme was MONSTERS and these cookies went along wonderfully with that theme. 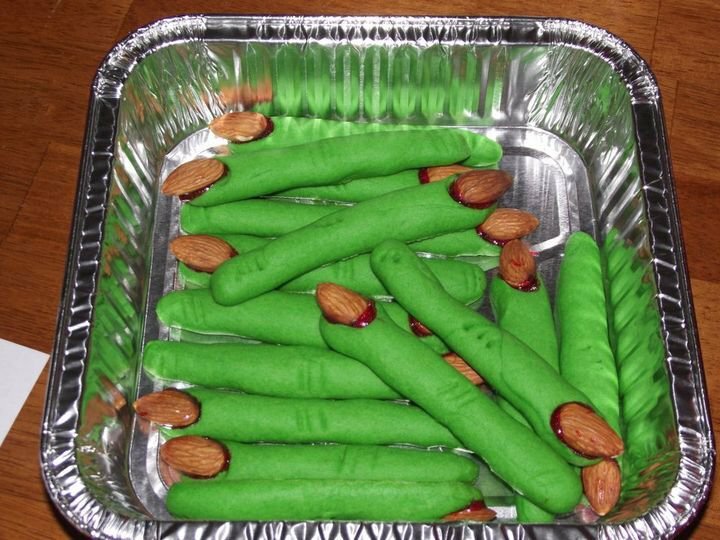 The kids loved them, both for the cool zombie finger look and for the sugar sweet cookie taste. There was not a single cookie left by the end of the party. It was a wonderful event. I think that these cookies will also be a perfect addition to any Halloween get together or party. I hope everyone enjoys the recipe and the cookies. Eat Up!! 1. Combine the butter, sugar, egg, almond extract, green food coloring, and vanilla extract in a mixing bowl. Beat together with an electric mixer; gradually add the flour, baking powder, and salt, continually beating; refrigerate 20 to 30 minutes. 2. Preheat oven to 325 degrees F Lightly grease baking sheets. 3. Remove dough from refrigerator in small amounts. Scoop 1 heaping teaspoon onto a piece of waxed paper. Use the waxed paper to roll the dough into a thin finger shaped cookie. Press one almond into one end of each cookie to give the appearance of a long fingernail. Squeeze cookie near the tip and again near the center of each to give the look of knuckles. Arrange the shaped cookies on the baking sheets. 5. Remove the almond from the end of each cookie; squeeze a small amount of red decorating gel into the cavity; replace the almond to cause the gel to ooze out around the tip of the cookie. Next Post Zack’s vs. Boston’s : It’s a good reason to be a divided household.